In the golden days of the First Age, the Exalted mastered the secrets of sorcery - the art of reshaping Creation itself through Essence and force of will. They conjured diamonds from the air and rode across the sky in burning chariots. But the Age of Splendor is no more, and now, all that remains are fragments of that knowledge. Can your reclaim the heritage of power that is yours? Can You Rise to the Challenge of Mastery? The Book of Three Circles details the intricacies of sorcery in the world of Exalted. 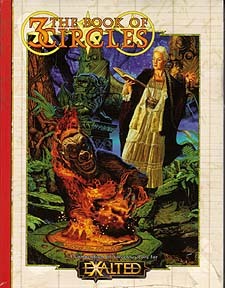 The book details over 100 spells from all three circles of magic. It also provides rules and information on Demesnes, Manses, Hearthstones and the creation of spells and magic items, as well as descriptions of over 25 new Hearthstones and magic items, including warstriders - the rare and powerful war machines of the First Age.